I don't know why this burns Optimal so much, isn't he himself a copy of Optimus Prime in a partial way? Thats right! It's that time of year when Big Lots gets all their Christmas toys in! 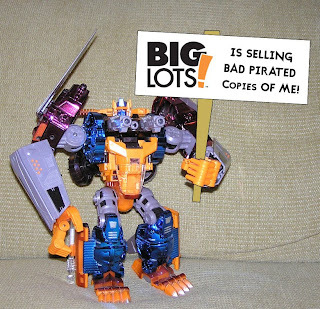 And what better way to bring cheer, then bootleg pirated toys! They had some doozies again this year. Returning was a TransMetal Dragon Megatron, dark blue and red like original. He was missing many of the quality joints that Hasbro had, but was the same size and everything. New this year was Optimal Optimus (not pictured). They are cheaper plastic for sure. Also They had this giant combiner robot with Transformer Cybertron mini Starscream for legs and mini Vector Prime for arms. Almost had to buy that to make fun of, but I'm trying to lean up my collection from unnecessary crap. And finally they had some strange giant Unicorn Centaur Transformer Megazord or something. If it wasn't 14.99, I would have surely bought that to make fun of. Not sure what the hell it was from, but very ugly and stupid looking. So if you want weird knock off toys, nows your chance at Big Lots! Thats right 500 posts! You can clearly see my photography skills jumping from the page. 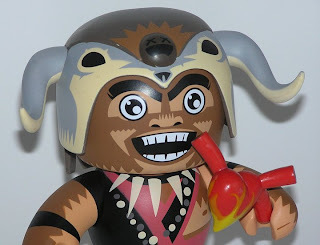 This is also my three year and one week anniversary of blogging fine toys! Not many people said I could do it. They said I was too 'silly' and 'need to grow up' and 'move out of the basement.' But I showed YOU all! 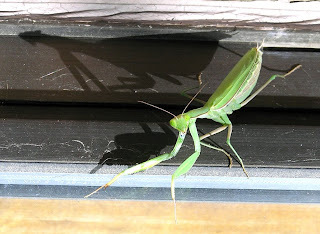 Now lets see, it seems that I have slowed down a bit in the blogging. The first 100 posts were done in about four months, 200 posts in 6 months, and even more for the next major post events. This means expect the 1000 post spectacular some time in 2056! Be there! So what is the deal with this picture? I will let you decide that! 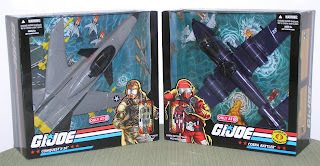 Well I had to drive from Boise to Nampa to get my Target Exclusive GI Joe Jets, ending an exhausting month long search. Thats a 25 minute drive each way (okay 45 minute each way, I drive like a Grandpa). I am so glad I don't have to go to Target ever again. Unless of course I want to get more. 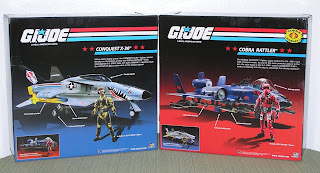 Here they are the GI Joe Conquest and the Cobra Rattler! Picked these up today. It wasn't embarrassing at all, when there was no line at first and I ordered them. It wasn't embarrassing when after I ordered them, the line got huge. It wasn't embarrassing while the girl was digging through the big box trying to find each separate kind, wasting time to help others. It wasn't embarrassing when the whole line of people started backing up behind me waiting for their food. It wasn't embarrassing asking for a large bag to hold all these. It wasn't embarrassing when the bag broke spilling Legos all over the place, causing every one to trip and fall and throw food everywhere. Well that last one didn't happen, but I would imagine that would be embarrassing. 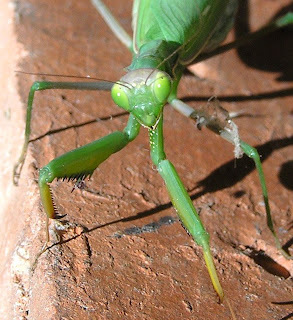 Preying Mantis rule the insect world. They are just so darn rare that when I see one I kind of flip out. 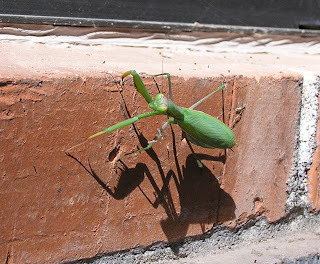 This dude was by our door today, nice and green. My neighbor said he was brown yesterday. The head spinning and antenna flipping is neat! Love the shadowing I got on this photo. Thats all for science Saturday! See you next week! That ending is pretty darn funny. I like how Hasbro admits that the toys are not for the kids anymore. Well, I still can't afford an aircraft carrier, so I will build mine again out of cardboard boxes with my Dad. 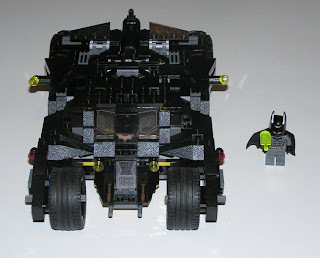 This is a must buy for any Lego fan or Batman fan. I had a blast building this thing. I might even throw it down some stairs and build it again! The only thing missing is some light suspension. I also like how finally Lego made a car that is a two seater! They always seem to skimp width wise and the vehicle ends up fitting just one. 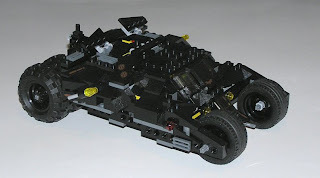 Not the Tumbler though, it fits two! Now I just need to find a Robin figure to ride pelletgun. And yes, thats a green venom pop that Batman's about to accidentally eat before he can take it to the Bat-lab. 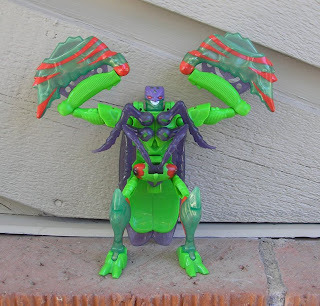 With fears of an eventual toddler in the family, my friend Steve parted ways with his Japanese version of Transformers Beast Wars toy Megatron. 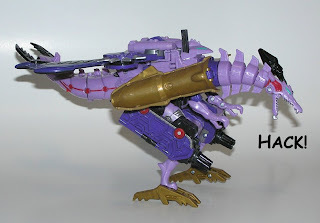 He is a spiffy purple dragon, instead of T-Rex. I have no idea how to transform him yet, as the box and instructions are all in Japanese. I would imagine too that a Japanese Transformer Transforms in a completely different way than a United States Transformer? 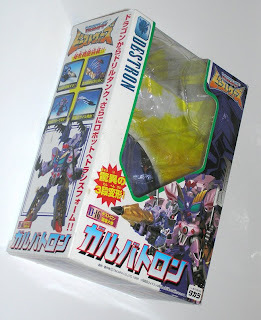 From the looks of the back of the box, I also have many other Japanese Beast Wars Maximals including Squidicus, Buffaloacus, and Baboonicus. But what happens when the day comes when I too get the honor of housing a toddler? How will I hide the toys? I wanted to start leaning up my collections now, since it will take about ten years to do so. I figured a neat idea to start. I got a Paypal card, so that I can only buy new toys with the funds of old toys selling on Ebay. I'm sure I will deplete that plan in a matter of hours, but maybe it will get me thinking about slowing down the buying. The problem with current toy trends of today, is that they keep making a better version of the same toy year after year. 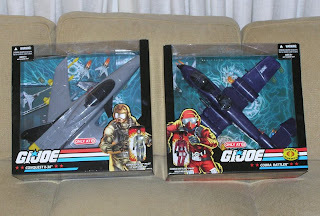 I have too many versions of the same toy, as we saw in my insane Cobra Commander/Duke numbers. 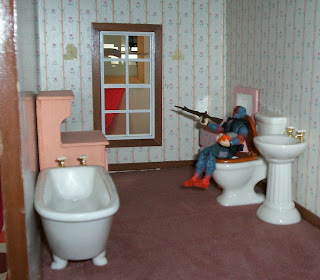 The other problem with owning too many toys is that they devalue what is your favorite toy. If you have 1000 toys, you loose track, and they become less in value to you. But, if you have just 10 toys, they become much more valuable. I would like to follow this idea, but in reality that won't happen until the retirement home I guess. Which makes for another post, If I could take only a few toys to the retirement home, what would I take? 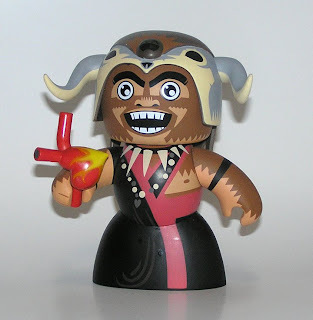 I'm not too big on cutesy Mighty Muggs, but I fell in love with this guy right away. Hilarious to the heart burning in his hands! Neat helmet too, I like how there is a little sad face on it. I like how he can almost eat the heart. Now I just hope this doesn't unleash Mighty Mugg collecting. I came up with a new phrase for myself the other day. Whenever I get a new toy from a new series of toys it's like opening a 'Dandora's Box'. My worst enemy could destroy me by simply giving me a new toy that I never collected before. It always results in me buying one more, then two more, then double that, then since I went that far, might as well buy the series. For example, a coworker recently dropped a McDonalds Bobble toy in my mail box. 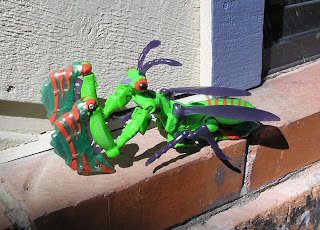 I never wanted to start with these toys, the look creepy, cheap, and the food they come with can kill. 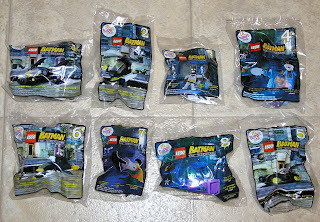 But, since I have one, might as well get another one, and another one, and another one.... Luckily I found a McDonald's that had them all, so they let me buy all the ones I wanted! Luckily Luckily I resisted the whole series, and just bought the ones I thought were funny to have. Rumor has it, a lady earlier in the day bought two of every kind for about 80 bucks. Crazy!